Brazil, Paraguay, Uruguay and Argentina. No specific details are available. A spacious tank is required, preferably with a sandy substrate. Provide hiding places and shade with some big chunks of driftwood and smooth rocks. Dim lighting is beneficial, and use a powerful filter to deal with the large amounts of waste it produces. Any plants are likely to be uprooted but hardy species that can be attached to decor such as java fern or Anubias may survive, as will floating varieties. A peaceful species that can be kept with a variety of tankmates, such as larger characins, cyprinids, peaceful cichlids and other catfish. 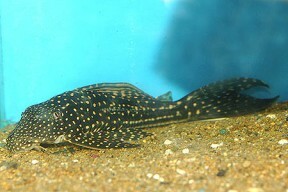 It’s territorial with any similarly-sized bottom dwellers, especially conspecifics, so a very large tank is needed if any other large catfish are to be kept. An attractive and very hardy larger plec.